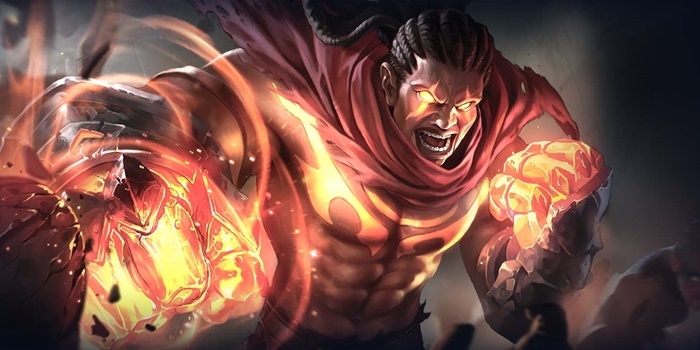 Guide for the hero Raz, a character in Arena of Valor (AoV). Included are Raz’s abilities, statistics, attributes, strengths, weaknesses, and more. These are Raz’s attributes on the mobile version of Arena of Valor. Click here for his attributes on the Nintendo Switch version. Raz’s footwork moves him closer to his enemies on his 2nd and 3rd consecutive normal attacks. The 1st normal attack of the combo deals extra magic damage, knocks back enemies, and stuns them. The 1st normal attack goes through some walls. Raz unleashes a powerful uppercut that deals 480 (+0.91 AP) magic damage to enemies within range and knocks enemies into the air. Restores 25 energy if the ability hits an enemy. Dashes after using Rising Uppercut when the directional pad is held. Raz launches a projectile from his fists that deals 500 (+0.9 AP) magic damage to enemies in its path, briefly reducing their magic defense by 50 and movement speed by 60%. Restores 25 energy if the ability hits an enemy. Dashes after using Power Surge when the directional pad is held. Raz throws an extremely powerful punch, dealing 720 (+1.37 AP) magic damage to enemies in its path and knocking them back. Restores 25 energy if the ability hits an enemy. Dashes after using Explosive KO when the directional pad is held. Can push through walls with trees. When you’re using Raz, try to plan out the best position in advance to avoid counterattacks. Hit enemies with a third consecutive normal attack to stun enemies before using a combo of his abilities. Our recommended order for Raz abilities as he levels up. See all of Raz’s item builds. The 1st normal attack of the combo deals extra magic damage, knocks back enemies, and stuns them. The game says on 3rd attack, not 1st.